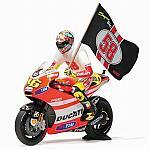 Ducati Desmosedici GP11 MotoGP 2011 Nicky Hayden - Special Limited Edition 700pcs. Ducati Desmosedici GP11 MotoGP Qatar 2011 Hector Barbera - Special Limited Edition 504pcs. Ducati Desmosedici GP11 Test Valencia 2010 Valentino Rossi Limited Edition 4999pcs.